Ford is increasing the appeal of the new 2014 Fiesta around the globe by adding new technology that is attracting new buyers. The all-new 2014 Ford Fiesta hasn’t even been launched yet and its getting lots of attention around the globe. The new Fiesta will feature a new exterior design, a new 1.0-liter EcoBoost engine and more new technology. The 2014 Ford Fiesta was unveiled earlier this fall with a new global design with new trapezoidal front grille, laser-cut headlamps with daytime running lamps with LED technology, and a power-dome hood. The interior has been redesigned for greater ergonomics and gets a host of new technology features. The new 2014 Ford Fiesta has one of the most comprehensive suite of in-car connectivity technology features available in a small car. The new compact adds MyFord Touch with improved voice recognition, navigation and phone pairing. 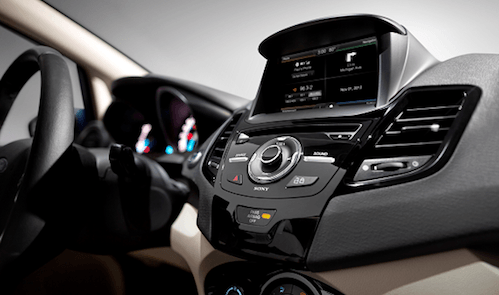 The new MyFord Touch features a new 6.5-inch LCD touch screen which is an upgrade over the current 4-inch screen. Ford has partnered with Microsoft to improve MyFord Touch with new capabilities and features including more natural and accurate voice recognition, simpler Bluetooth phone pairing and better navigation controls. Younger consumers are looking for the latest technology as they decide which car to purchase, and the new Fiesta certainly delivers. The new technology helps keep consumers stay connected to their lives and at the same time helps them “keep both hands on the wheel and eyes on the road.” The new system uses simplified bluetooth phone pairing where the driver simply has to hit “OK” if the PIN on the phone and touch screen match. It features a more natural voice recognition and drivers can now simply say “Play name” when requesting a specific artist, song, album or type of music. It also includes improved voice recognition accuracy by using the latest version of Nuance’s speech software, VoCon 3200 v4.2. Drivers can say the station frequency, “AM 760,” or the official name of the Sirius station, like “Hits 1,” to tune the radio. There is also simplified navigation controls for easier entry of an address. The all-new Ford Fiesta in Europe will feature a number of advanced technology features like Active City Stop, a system designed to help drivers avoid low speed collisions. European models will also feature the first-ever MyKey for this segment, which will enable parents of teenage drivers the ability to configure maximum speed and audio volume limits. The new technology on the Fiesta is driving up purchase consideration and appeal of the small compact around the globe. Both parents and young consumers are considering the all-new 2014 Ford Fiesta because it gives buyers the technology they want in a new car.